As I mentioned in my post about ICM 2015 conference in Barcelona in July, heat assisted magnetic recording microwave (HAMR) — a type of energy-assisted magnetic recording — has been employed in terabit-level magnetic recording technologies. Another energy-assisted magnetic recording technique is microwave assisted magnetic recording (MAMR). This is a combination of microwave assisted switching (MAS) and spin torque oscillator (STO), in which a radio frequency (rf) field generated by the STO induces magnetization switching. 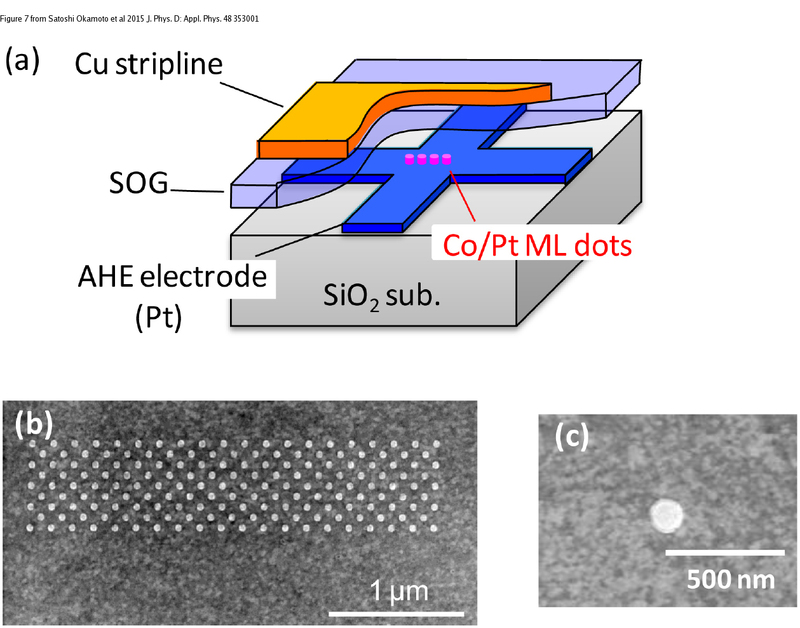 In a recent topical review published in JPhysD, Satoshi Okamoto et al from Tohoku University, Japan discuss MAS behaviour, which still presents scientific and technological challenges, and tuning magnetization precession modes to enhance the MAS effect, as well as the STO and its stable operation for recording technologies. (a) Schematic illustration of the device for microwave assisted switching (MAS) experiment. Examples of the SEM images of (b) a dot array and (c) a single dot of Co/Pt. Image: Schematic representation of a magnetic semiconductor (left), a conventional compound semiconductor (middle) and a diluted magnetic semiconductor (right). Adapted from Satoshi Okamoto et al 2015 J. Phys. D: Appl. Phys. 48 353001. Copyright IOP Publishing 2015.